PARIS — The European Central Bank should begin large-scale bond buying to ensure that weak price pressures do not further undermine demand in the eurozone, the Organization for Economic Cooperation and Development said on Monday, as it cut its forecast for growth in the developed world. “A moderate expansion is underway in most major advanced and emerging economies, but growth remains weak in the euro area, which runs the risk of prolonged stagnation if further steps are not taken to boost demand,” the O.E.C.D. said in a report. The United States will post 2014 growth in gross domestic product of just 2.1 percent, the organization said in an update to its annual forecasts, worse than the 2.6 percent it had previously expected. The eurozone, which has 18 member nations, will grow only 0.8 percent, the O.E.C.D. said, revising downward its previous forecast for an expansion of 1.2 percent. Quantitative easing, a policy that has been used in the United States by the Federal Reserve, the Bank of Japan and the Bank of England, involves the outright purchase of bonds on a large scale, flooding the financial system with money in an effort to broaden the availability of credit and lift economic growth. The European Central Bank has become increasingly concerned about the very low inflation in the eurozone. Consumer prices rose just 0.3 percent in August from a year earlier, and already there are warnings that a Japan-style crush of falling prices could lead consumers to hold off on purchases and push more borrowers into bankruptcy, with dire effects on the bloc’s already struggling lenders. The bank announced a set of new measures on Sept. 4, including plans to begin buying packages of loans that banks bundle and sell to investors. The central bank’s president, Mario Draghi, also said central bank officials were studying the possibility of enacting a program of quantitative easing. The O.E.C.D. joins a growing chorus of economists in calling on the central bank to undertake quantitative easing. 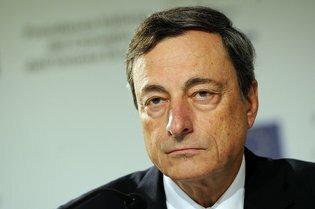 In July, the International Monetary Fund calledfor such measures, “particularly if external risks materialize and the inflation outlook worsens.” There is substantial opposition to quantitative easing in Germany, so Mr. Draghi, unlike central bankers elsewhere, faces a political challenge to the policy. The O.E.C.D., which is based in Paris, serves as a forum for discussion and research for the most economically advanced countries. It warned that there were “many significant risks to the near-term outlook” for Europe, including geopolitical risks stemming from conflicts in Ukraine and the Middle East, and the uncertainty surrounding the Scottish independence vote on Thursday. “The bullishness of financial markets appears at odds with the intensification of several significant risks,” the O.E.C.D. continued. It cited equity markets at or near record highs, government bond yields near all-time lows in many developed countries, and stock market volatility at levels approaching those seen before the 2008 financial crisis. “This highlights the possibility that risk is being mispriced and the attendant dangers of a sudden correction,” it said. While the organization reduced its forecast for economic growth in the United States this year, it projected that growth would accelerate in 2015, with American gross domestic product rising 3.1 percent. The O.E.C.D. projected that the eurozone would grow a modest 1.1 percent in 2015. It forecast that the Japanese economy, which is receiving a major injection of monetary stimulus from Japan’s central bank as part of Prime Minister Shinzo Abe’s economic program, would expand by 0.9 percent this year and 1.1 percent in 2015. It projected that China, which is not a member of the O.E.C.D., would grow 7.4 percent this year and 7.3 percent in 2015.